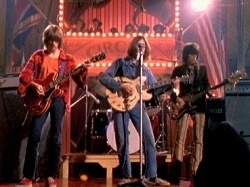 Notes: John & Yoko participated in a planned Rolling Stones TV special called "The Rolling Stones Rock and Roll Circus". Apart from a "sketch" with Mick Jagger and introductions for both John`s and the Stones segments, John`s main contribution was as the lead singer/guitarist of "The Dirty Mac" a specially put together band just for this occasion. 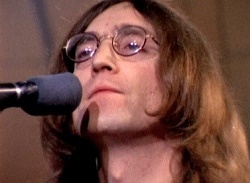 The band consisted of John, Eric Clapton, Keith Richards, Mitch Mitchell, Ivry Gitlis (on violin) and Yoko. They performed an excellent version of John`s "Yer Blues". The TV special however was never broadcast and gathered dust, unfinished, for almost 30 years before it was found, re-edited then released on video (and later on DVD) in beautiful quality. 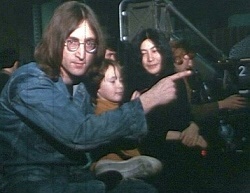 The DVD also includes a jam session with Yoko and "The Dirty Mac" which they labelled "A Whole Lotta Yoko". John`s special introduction for the Stones segment was filmed on Jan 21 1969.